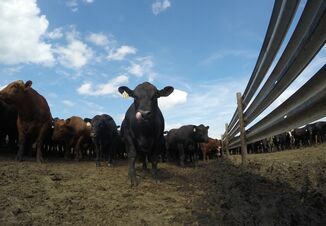 (Bloomberg) -- Mad cow disease has been found on a U.K. farm for the first time since 2015, raising concern that some countries may move to limit imports of British beef if more cases are found. The disease, also known as bovine spongiform encephalopathy or BSE, was confirmed on a farm in Aberdeenshire, eastern Scotland, according to a government statement. Officials stressed that the case is classical BSE and animal did not enter the food supply. If BSE is confirmed in more animals, there’s a chance that importers would cut off purchases of British beef because of fears linked to the disease. In the 1980s and 1990s, Britain suffered an epidemic of mad cow disease that killed several people and led to widespread export bans on beef. Eating meat from animals infected with BSE has been tied to Creutzfeldt-Jakob disease, an incurable human illness that destroys brain tissue. More than 185,000 BSE cases in cattle were confirmed in the European Union during the previous epidemic. Since then, cases have been sporadic and isolated. Britain has worked to sell beef as a premium product to other countries and assure consumers of its safety. In recent months, the industry has been courting China as a new market. China lifted its ban on U.K. beef imports in June following more than two decades of restrictions due to mad cow disease. The Scottish government said precautionary restrictions have been put in place at the farm and further steps are being taken to identify the origin of the disease. Scotland will likely be considered an area with “controlled risk” of BSE, instead of “negligible risk,” according to Quality Meat Scotland, which represents the industry. England and Wales are considered “controlled risk,” a designation determined by the World Organisation for Animal Health. The new status will require slaughterhouses to take extra steps to ensure other animals are not contaminated with BSE, said Martin Morgan, the executive manager of the Scottish Association of Meat Wholesalers. He said the additional cost for the industry could be roughly 5 million pounds ($6.5 million) a year.